A version of this interview appears in the catalog of the Hippie Modernism show at the Walker Art Center, Fall of 2015. This is a further editing of that version. 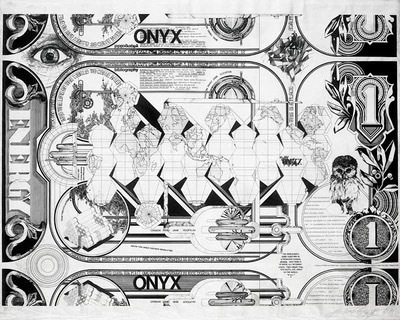 Esther Choi: In the early 1970s, Jim Burns featured ONYX in his seminal book Arthropods alongside an international array of architectural collectives. While reading your account of ONYX’s formation on your website, I was struck by how different your model of collectivity is compared to the other groups in Burns’ book. Rather than revolving around a narrow set of objectives, maintaining diverse perspectives within the collective was valued and central to your output. Woodson (Woody) Rainey: Ron and I both attended the University of Utah in the fifties and sixties. The architecture school was exceptional in its strong emphasis on developing graphic skills. The university’s art school was across the street and there was significant interaction between the students of both schools. When we moved to New York, Ron lived nearby and we discussed our ideas night after night. We were also drawing constantly. We thought that other people might be interested in these conversations and we talked about writing a communal letter. That notion grew into a collage of drawings and ideas. We thought that it would be interesting to see what happened if we sent it out anonymously. We produced several hundred copies of the first broadsheet (fig. 1), hand addressed and mailed them to a few hundred people. We had a tremendous response—mostly questions like: “Who are you? Who do you do this for? Why are you doing this?” and, “Can I have one? Can you send one to my friend?” Sometimes people would share things with us. Ed Ruscha sent us a book. We encountered Ant Farm. A network began to develop. We came up with the name ONYX. It was a wonderfully graphic word: O-N-Y-X. It could be an acronym for something else. It looked great in print. It referred to the multilayered stone; there were a lot of aspects to the name. At least until the presentation of our first piece, ONYX was not a collective. It was Ron and I drawing and making the broadsheets. Ron Williams: I'm hesitant to even refer to ONYX as a collective because I see collectives as having singular aims and a collective consciousness pursuing those aims. A more accurate description of ONYX would be that it existed as anti-collective or non-collective. We were in favor of a diversity of ideas rather than a singular idea. Fig. 1 The first broadsheet. EC: Can you explain how you collaborated on these pieces? RW: We didn’t collaborate conceptually. We didn't work in isolation or hesitate to comment on each other's work. WR: We didn’t sit on opposite sides of the table sketching. RW: I can’t remember a time when one of us told the other that their work looked bad. We never criticized or had anything negative to say about each other’s work. Mike Hinge did work, for example, for science fiction and fantasy magazines. I learned from it, marveled at it and how well it was done. EC: I have been thinking about how your very stylized moniker ONYX served—and I use this word somewhat tentatively—like a branding device for the collective. Although the content of your posters and your own personal interests differed substantially, the logo ONYX remained consistent. Could you talk about your decision to do this? RW: The logo really wasn't consistent. The idea of a logo as they were used then didn’t apply. We spelled the word with images of trees, with circuit board graphics, different typefaces. The idea was to move beyond a word that meant just one thing, like the logo for a bank. We used the word as a symbol for a variety of ideas. I think “brand” is probably not a word that any of us would have chosen. WR: We didn’t put our real names on the first broadsheet. The yellow broadsheet for example, is by Patrick Redson, a nom de plume, and we used other names. ONYX gave us a vehicle for thinking in a different way. You could posit any idea and send it out under this umbrella. They were sometimes goofy, sometimes serious and there are some that we're still interested in forty years later. RW: There were all kinds of things that could pop up and contribute to the conversation. We didn’t do a lot to avoid the scene here; we just didn’t get involved in the academic and limitedly popular conversation that was going on then. Our work was graphic. I think there was apprehension toward our "project" as it was outside of any example of the work anyone else was doing. To support ourselves and keep ONYX going, we had jobs in architecture much like an artist or actor might have a job waiting tables or selling clothes. EC: Could you say more about this apprehension toward ONYX’s work on the part of your audience, and in particular, on the part of the academy or the institution? ONYX was perceived as borderline [hippie] because we found a lot of interesting graphics in what hippies were doing like music posters and head comics. We looked at a lot of the music world's printed material, largely from the standpoint of seeing how people assembled it. And there was Tadanori Yokoo in Japan. WR: There’s a cartoon of William Morris giving a lecture: he’s a large man with his back to the audience weaving on a loom; in a way, I think that’s what we were like. Basically two networks were growing: There was a theoretical network around the talk at IAUS in New York and Europe. The other was the “counter-design" or "alternative design” people such as the Arthropods group. It stretched from Japan, Italy, Vienna, San Francisco and Texas to New York. We didn’t know about anybody other than Archigram when we started publishing, but almost immediately many of these groups corresponded with us. What we were doing was physical, graphic, rather than being theory oriented. 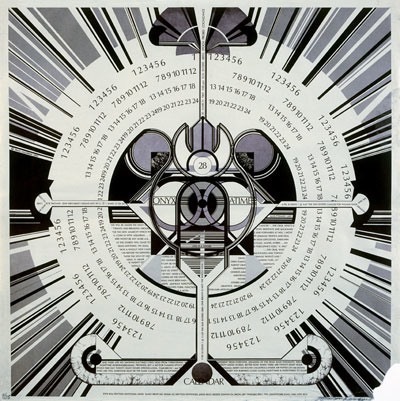 Louis Sullivan, the Fillmore posters, Archigram and Superstudio, whom we admired for their graphic works, were all of interest. I still draw the Sullivan ornaments to try to figure out what he was thinking when he made them. There’s not a lot of theory in that unless you get into geometry or craft theoretically. It’s easier to sit with your back to an audience and draw. EC: How did you feel about being affiliated with the Whole Earth scene? WR: I was excited by the Whole Earth Catalog. That excitement had to do with the Whole Earth Catalog's gathering of practical information for use in alternative ways; we were into gathering information. There was also a shared a kindred spirit about the Earth. RW: The Whole Earth Catalog was of and for the many — and we were of the many. We felt compelled to share ideas. It’s like the discussion groups that you see on the web. I think that a lot of what happened with the development of the computer and the refinement of the web arose out of the ideas, longings and visions that a lot of people had at that time. WR: An interesting experiment might be to produce another broadsheet. I think we could send one out today and it would generate a similar response. It’s unusual to get anything in the mail today; anything of interest usually arrives on the Web. I've wondered what are these broadsheets? Are they authentic? I’m confident we did something that’s retained its integrity. EC: Some historians have explored how the Whole Earth Catalog offered an early, idealistic model of the web, which led eventually to the formation of the Internet. Some have also explored how mail art precipitated the networks of the Internet. What was your relationship to mail art? RW: Ray Johnson and others involved in the Fluxus movement responded to the ONYX material we sent to them. It was gratifying to realize that though we didn't understand Fluxus, none of those involved in it understood it either. While that constituted one network, the Whole Earth Catalog became quite attractive. 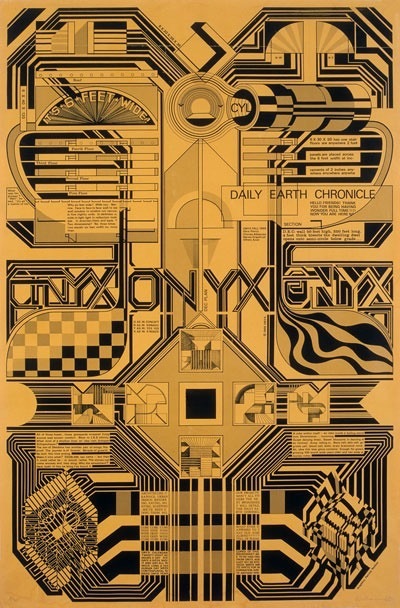 A lot of our contributions to the Whole Earth Catalog were made as ONYX. EC: Clearly, the computer changed your practice as architects. RW: Not really, we continued to draw. Business letters became easier to deal with and store. The KayPro and the first Mac computer came along. The one thing I wanted most when I was drawing these images was a computer that could ease their production. When the computer finally did replace that effort there was no need for it anymore. The dissolution of analog as a means of communication was comfortable. Now we're back into the cyber world with websites, blogs and tweeting birds. EC: Were you reading about systems theory or thinking about technology in a conscious way? Did that interest you at the time? WR: I recall being very interested in Marshall McLuhan and his first book, The Mechanical Bride. I also became interested in the idea of a cybernetic forest, from Richard Brautigan's poem, All Watched Over By Machines Of Loving Grace. But I've never been a cyber guy and that was probably because I loved to draw. You could always find someone else to do the computer stuff. RW: We were into systems and what their development might mean in school and in a way we were already using the systematic approaches being discussed at the time. I was doing paintings that were organized with multiple arrangements of paths and ellipses that made analyzable arrangements of some depth. They were meant to visualize the implications of what happens when systems interact. There’s an irony there: it was also a time when you could always find someone to draw. EC: Although the ONYX project was predicated on communication, you’ve said that, in some ways, there was not much literally, to say, i.e., you weren’t interested in communicating your ideas linguistically. WR: Graphics were our vehicle for conversation. RW: I hesitate to call what we sent out "posters". A poster is something that has a simple message. When these arrived in the mail folded, then opened and looked at for the first time I think they seldom made it onto a wall. These broadsheets could only be called posters in the spirit of Jalal Toufic's call for a poster that begets what it announces; as posters, these sheets would be begetting the projects they announce and depict. EC: I’d like to talk more about your graphic strategies and in particular, how your graphics operate in a flat and projective manner that’s different than a rendering. If you take, for example, Superstudio’s Continuous Monument, they’ve illustrated an entire scene using the conventions of perspective. In your broadsheets the effect is extremely destabilizing for the viewer, whether you’re reading the text or reading the image. It’s more accessible and immediately engaging than a more conventional architectural rendering. It’s a very compelling visual experience that embodies at once the verbal and visual description of the architectural projects in the graphic presentation. Was the project born from an active desire to push against the usual constraints of architectural representation? Your experimental approach made spatial graphics simultaneously more accessible and more complicated. WR: We both made a living to some degree as architectural illustrators, and we helped to establish the axonometric as a reasonable projective technique. It was the first time that anyone did anything that wasn’t conventionally illustrative. RW: We were accomplished as far as being architectural renderers. We had a clientele; there were people who just wanted us to produce their presentation drawings. For us, there was always the question: “Is there another way?” In the Eastern depiction of space there’s a particular way that the hierarchy of the drawing is assembled. Axonometric conventions show an object as it is, rather than how it appears. We had architectural ideas that were not often susceptible to the conventional techniques of rendering. The axonometric became more expressive of these ideas as opposed to "projects". We weren't pushing against anything. We'd just found a different way of expressing our ideas. EC: The way you’ve assembled the varied references on your broadsheets akin to conventions used in traditional East Asian landscape painting and along with the nature of your line work, it has an effect of rendering meaning to all of these signifiers as equivalents. RW: Yes. That’s a good description of what this style does. An interpretation of the axonometric illustration is that it is of an idea whereas the perspective picture is of what the idea would look like realized. EC: The sources of ornament in your broadsheets relate both to architecture and popular culture. Along with Louis Sullivan, there’s a pronounced psychedelic element to your work. Both relate formally. WR: When we referenced other media, we weren't relating to other cultural events. The "Filmore" posters were specifically about the music. Our work used those forms as a jumping off point, as inspiration. These forms allowed us to map personal affects. The Energy Certificate broadsheet was a personal narrative (fig. 3). I was about to move back to Utah. We were interested in Buckminster Fuller and the geometry of his maps. I used that reference to illustrate the route back to Utah: how I was going to get there – and to talk about my childhood. It was a statement that was only related to ONYX in form. The form was used to employ the graphics and allude to the idea. EC: The British industrial designer and botanist, Christopher Dresser, a major influence for Sullivan, wrote that, “Ornament, then, ever has expressed the sentiments of the age in which it has originated, and the ancient decorative forms still tell of the faith of our ancestors; but as our creed differs from theirs, and as we are not prepared to endorse all their sentiments, we cannot fitly appropriate to ourselves those ornaments with which we do not sympathize, as they are an expression of sentiments in which we cannot concur.” Dresser’s theory proposed that ornament offers a mode of representation that captures and conveys the appropriate affects of the time, associatively, non-linearly and non-linguistically. This echoes theories of typography and typeface design. RW: I find Dresser's comments compelling but obscure. My attitude toward ornament is based on "relief for the eye". In a space that’s ornament free, there’s little to impel the eye to change focus. A modernist’s column meets a beam or ceiling minimally - there's no reason to look there. When a column’s top has a capital, the focus we use to apprehend the larger space changes. Our vision narrows and our depth of field changes. The whole space appears and feels differently, our sense of scale and dimension is altered. The experience of the wealth of ornament on a Sullivan building takes the encounter to another level, beyond the boring rectangular framework of the ordinary building onto an image of nature in its richness and possibility, a playground for the eye. EC: What I find particularly fascinating is how your architectural proposals—the Daily Earth Chronicle, the Six Foot House, the Head Start Monument and Woody's House-Turned-Inside-Out are nested in a field of ornament, compiled from both architectural and “vernacular” sources, enabling one to consider and contextualize your spatial propositions amidst a haze of atmospheres, attitudes and affects - - typically not the material or conceptual “stuff” of architectural discourse or practice. RW: At last, the subject matter. Yes, we did have something to talk about, graphically, of course. There are lots of drawings, paintings, models and writing about these projects and others as well. We haven't exorcised these ideas from our conscious; it's still a dream to build the Daily Earth Chronicle. But now instead of setting it up on the Nebraska prairie, it's to put up a full sized model in the New Museum in New York, projecting out over the Bowery in all its glory. The "field of ornament" presents an attitude beyond what we mentioned earlier about architectural embellishments. I have to refer again to the eye and the pursuit of its delight. An abiding principle for some time in the fifties was Vitruvius' "Firmness, Commodity and Delight". Aside from the discussion of the principle that has sustained writers ever since, it was a sub rosa influence on us, never overt. The situation with the broadsheets might be simply attributed to a more primitive impulse, the fear of empty space. But isn't that what drives the urge to build? Our fields of ornament are probably metaphorically symbolic. See Christopher Dresser, The Art of Decorative Design (London: Day and son, 1862), 14.